Mardi Gras is Feb. 24 this year, and the chefs at The Culinary Institute of America suggest you celebrate it Cajun-style by serving Crawfish Étouffée. (Note: It'll work with shrimp, and I've even substituted chunks of catfish fillets for this dish). According to the Oxford Encyclopedia of Food and Drink in America, the humble crawfish (known more widely as crayfish) owes its stardom to the Cajuns and is plentiful in the freshwaters of Louisiana's bayous and lakes. Crawfish finds its way into many dishes, but the little crustacean is mostly identified with étouffée, a Cajun translation of "smothered," derived from the French étouffer. "Étouffée is the name given to dishes like this one that are gently cooked in a covered pot," explains CIA Chef Kathy Polenz. "Crawfish, or crayfish, are sold live or as cooked meat. If you buy crawfish meat, look for the words fat-on. Crawfish fat is an integral part of a good étouffée." So, let the chefs of the CIA show you how to "laissez les bon temps rouler!" ("let the good times roll! "), by cooking up a pot of Crawfish Étouffée for Mardi Gras this year.The following recipe can be found in The Culinary Institute of America's One Dish Meals (2006, Lebhar-Friedman) cookbook, which is available for purchase at bookstores nationwide. Heat the bacon fat or oil in a casserole or Dutch oven over medium heat until it shimmers. Add the onion and sauté over medium heat, stirring frequently, until the onion is translucent, about 6 minutes. Add the celery, bell pepper, and garlic; cover the pan and cook over low heat, stirring occasionally, until the vegetables are tender and translucent, about 10 minutes. Add the paprika, white and black pepper, cayenne, and 1/2 teaspoon salt; sauté, stirring constantly, until aromatic, about 1 minute. Sprinkle the flour over the vegetables and continue to cook, stirring constantly, until the mixture is thick and pasty, about 3 minutes. Add the broth and stir well to work out any lumps. Bring to a simmer over medium heat. Add the crawfish tails and their fat. Cover the pot and cook over very low heat, stirring frequently, until the crawfish is cooked through and very hot, 8 to 10 minutes. Add a little more broth as needed throughout the cooking time if the étouffée is getting too thick. Season to taste with additional salt and pepper. Add the butter, scallions, basil, and parsley and stir to combine. Serve the étouffée in heated bowls. Nutrition analysis, étouffée without rice per an 11-ounce serving: 340 calories, 27g protein, 16g carbohydrate, 18g fat, 370mg sodium, 95mg cholesterol, 2g fiber. From the Your Table section of today's Anniston Star, a humble offering of old school American recipes that have never gone out of style. Cheers! After their inauguration Tuesday, President Barack Obama, Vice President Joe Biden and about 200 guests sat down for lunch in Statuary Hall on Capitol Hill. Another president, Abraham Lincoln, is Obama’s hero. So it’s appropriate that the first meal Obama ate as president was inspired by the Lincoln White House. On the menu for his inaugural lunch: seafood stew of lobster, shrimp and black cod topped with a puff pastry dome; duo of pheasant and duck served with sour cherry chutney and molasses sweet potatoes; and apple cinnamon sponge cake with sweet cream glace. Not sure Lincoln would have had glace, but we won’t quibble. The lunch, organized by the Joint Congressional Committee on Inaugural Ceremonies, included members of the Supreme Court, Cabinet designees and the congressional leadership. Chefs spent months researching the food and cooking style of the 1860s. Wild game, especially duck, appeared on many White House menus of the day. Apples were widely available. January in D.C. calls for hot and substantial, but it also brings to mind some famous recipes that have been handed down through the years. The restaurant in the Senate section of the Capitol serves bean soup every day – and has for more than a century. And while some pages will insist it’s served the same soup every day for more than a century, the recipe is actually a pretty good bean soup for a cold day on the Hill. Not to be outdone from the heartland, The Truman Library in Independence, Mo., has dozens of recipes that Bess Truman whipped up regularly for her family and friends: American classics like meatloaf and mac-and-cheese. Finish your presidential meal off with something sweet, such as Mamie Eisenhower’s fudge, which still makes the rounds at Christmas, or the tart cranberry pudding served at Mount Vernon. Thanks to our friends at The Washington Post for doing the legwork on the menu particulars. According to one story, the Senate’s bean soup tradition began early in the 20th century at the request of Sen. Fred Dubois of Idaho. Another story attributes the request to Sen. Knute Nelson of Minnesota, who expressed his fondness for the soup in 1903. The recipe attributed to Dubois includes mashed potatoes and makes a 5-gallon batch. Well, he was from Idaho, so what do we expect? This is the original recipe, which included mashed potatoes – the ultimate thickening agent of its day. Oh, and this makes five gallons, so prepare to freeze some. Clean the beans, then cook them dry in a large (really large) pot for a few minutes to heat them. Add ham, bone and water and bring to a boil. Cook until begins just get soft, but still have some texture. Add potatoes and mix thoroughly. Add chopped vegetables and bring to a boil. Simmer for one hour before serving. Mix and form into a loaf. Bake at 350 for 1 1/2 to 2 hours. Several slices of bacon add to flavor if put on top at baking time. In a baking dish, place layer of macaroni, then add a layer of cheese. Repeat your layers to use everything up. Combine milk and eggs; pour over macaroni and cheese. Dot the top with butter. This can be made up to this point and refrigerated for a day – just take it from the ’fridge and let it warm up some while your oven is preheating to 350. Then bake at 350 until hot and bubbly. Combine eggs, sugar, salt and molasses. In a separate container, put 2 teaspoons of soda in 1/3 cup boiling water. Add to egg mixture. Stir in flour and cranberries. Steam in a buttered rice steamer for 1 1/2 hours. Serve warm with the sauce. Melt butter. Add sugar and half and half and stir until sugar is dissolved. Boil the sugar, salt, butter, evaporated milk together for six minutes. Put chocolate bits and German chocolate, marshmallow cream and nutmeats in a bowl. Pour the boiling syrup over the ingredients. Beat until chocolate is all melted, then pour in pan. Let stand a few hours before cutting. Remember, it is better the second day. Store in tin box. Soak beans overnight in water. Drain and rinse. In a slow-cooker, add all ingredients and 2 cups water. Turn to low and cook for 10 hours. Stovetop/oven: In a Dutch oven, put the rinsed beans and all ingredients. Simmer on the stove about 1-2 hours, partially covered, until the beans soften. Then pour into a baking dish and bake at 350 for another hour. Brown pork in a Dutch oven or heavy pot. Add onion and celery and cook about 3 minutes. Sprinkle on the flour and cook about 1 minute more, stirring to coat the vegetables with the flour. Add the potatoes and chicken broth, then cook over low-medium heat until the potatoes soften, stirring frequently so the vegetables don’t stick. Don’t worry if some of the potatoes start to break apart – that will help thicken your chowder. Add remaining ingredients, then cook, covered, over low heat for about 15 minutes. DO NOT BOIL. Taste and add more salt and pepper, if necessary. WHAT: Martha will interview Anthony Bourdain and Eric Ripert during a live broadcast of At Martha’s Table, an exclusive SIRIUS XM series. Martha will discuss their accomplished careers and achievements, including Anthony’s bestselling book, Kitchen Confidential, and his series, No Reservations, now in its fifth season on the Travel Channel, as well as Eric’s experience as chef and co-owner of the world-renowned and award-winning Le Bernardin restaurant in New York City. Martha, Anthony and Eric will also share their own tips, personal recipes and kitchen secrets with SIRIUS XM listeners who are encouraged to call in and ask questions during the live broadcast at 866-675-6675. “The Best of SIRIUS” package. SIRIUS XM’s Martha Stewart Living Radio. The series features Martha Stewart’s intimate conversations with today’s most influential tastemakers. Recent guests include internationally-acclaimed chefs and restaurateurs Jean-Georges Vongerichten, Mario Batali, Emeril Lagasse, Tom Colicchio and Jamie Oliver. Anthony Bourdain is a renowned American chef and author who won critical acclaim for his bestselling book, Kitchen Confidential, as well as his culinary and cultural adventure series, No Reservations, on the Travel Channel. He has written eight other books including A Cook’s Tour, Nasty Bits and No Reservations. Internationally-recognized chef of Le Bernardin in New York City, Eric Ripert is one of America’s top chefs. Eric and Le Bernardin have been awarded the following accolades: four-star rating from the New York Times since three months after it opened in 1986; three-stars from the Michelin Guide; GQ magazine’s “Best Restaurant in America; ” New York magazine’s “#1 Restaurant in New York City;” The Zagat Guide’s “Best Food” award; and The James Beard Foundation’s “Outstanding Restaurant of the Year” and the “Top Chef in New York City.” Eric is also the author of three cookbooks, including this year’s On the Line, a behind-the-scenes look at the inner workings of a four-star restaurant. On Martha Stewart Living Radio SIRIUS channel 112 and XM Radio 157, Martha Stewart and her team of lifestyle experts teach, advise and inspire around-the-clock with shows about entertaining, cooking, pet care, gardening, weddings and much more. This glorious weather (not being sarcastic. I love cold weather) puts me in the mind of soups and stews. I've been on a soup tangent for some time now. I've tried not to inflict it on too many people, but today just SCREAMS soup. The beutiful thing about soup is that it rarely tastes the same any time you make it. They are among the most forgiving of all dishes -- a little variation in a recipe generally adds character and is rarely a deal-breakers. They don't have the pouty nature of baked goods. They won't crash and burn and dry like chicken or beef, if you get careless. Pour all ingredients (except pasta, cheese and olive oil) into a large saucepan and bring to a boil; reduce heat, cover and simmer for about 20 minutes. Add the spaghetti and cook about 12 minutes more or until the pasta is tender. Serve in bowls topped with some cheese. If Italian vegetable soup won't work, try this one from Quebec. It's not red or tomato-based, like most vegetable soups, which makes it ideal for folks who can't stomach tomatoes. A few Octobers ago, I had it at a restaurant in Quebec City. Super easy and, agian, four servings ready in less than an hour. Melt the butter, then whisk in the flour and cook over medium heat for about a minute. Add the vegetables and stir. It'll be chunky and pasty. Stir in your cold or room-temperature broth/stock. Add salt, pepper and nutmeg, cover and simmer for about 30 minutes. In a small bowl, beat the egg yolks and the cream. Take ladle and put some (1/2 cup) of the hot soup and stir quickly into the cream-egg mixture to 'temper' the egg yolks (you don't want scrambled eggs). Then, just as quickly, whisk the egg-cream-soup mixture back into the full batch of soup. Stir briskly and cook for about 4 minutes until it's heated through. This recipe was provided to the Joint Congressional Committee on Inaugural Ceremonies by the luncheon's cater, Design Cuisine of Arlington, Va.
36 large shrimp, peeled, cleaned and tail removed, about 2 pound. Bring 1 gallon of water to a boil; poach lobsters, then shrimp, then black cod and last scallops. After seafood is cooked, remove from water; reserve water and bring to boil. Cook all vegetables in liquid that was used for the seafood; remove vegetables when tender. Allow the liquid to continue to boil until only 1 quart of liquid remains. This will be the base for the sauce. Bring seafood liquid back to a boil and add the vermouth and heavy cream and reduce by half, season with salt, white pepper and nutmeg to taste. You have reached your desired thickness when the sauce will cover the back of a wooden spoon. Set aside to cool. Cut lobster, shrimp and scallops into bite-sized pieces. Preheat oven to 400 degrees.6. Fold seafood and vegetables into cool sauce, being careful not to mix too much as this will break up the seafood. Scoop mixture into terrines or ovenproof baking dish of your choice. Cover terrines with puff-pastry rounds, brush them with egg wash and bake them until golden brown, about 8-10 minutes. Allow to cool for 5 minutes before serving. You can cook this 2-3 hours ahead of time and keep warm at 150 degrees. Makes 10 servings. Love gourmet meals but need to watch that budget? Sign up for Food Network Cooking Classes at The International Culinary School at The Art Institute of Atlanta and you'll find exiting ways to turn your home into a gourmet dining room! Cooking at home brings families together, gives you new ways to be creative in entertaining friends and neighbors, and offers a cost-saving option you can actually control. Whether you're unsure how to boil water or already have some fundamental cooking skills, you'll find a class to suit you. Winter offerings include fall favorites such as "How to Boil Water I," "Classic Steakhouse Favorites," "A Night in Tuscany," and "Cupcake Extravaganza." New classes for winter include "Gourmet Meals on a Budget," "Healthy Choices, Big Flavors," "Romantic Dinners," and "Entertaining at Home." Classes begin Jan. 24 and are from 10 a.m. to 2 p.m. (Eastern time) on Saturdays in The International Culinary School kitchens at The Art Institute of Atlanta. Food Network Cooking Classes are hands-on workshops geared toward cooks of all experience levels, offering tips and techniques from Food Network's behind-the-scenes team of experts, the Food Network Kitchens. Participants have an opportunity to learn what the pros know and how to cook in a fun, approachable way. The fee, which includes all ingredients and use of equipment, is $119 per class per person. To help you control your budget, you may want to take advantage of this special offer - purchase three classes and get a fourth class free! For more information or reserve your space, go to www.foodnetworkclasses.com or call The Art Institute of Atlanta at 770.689.4764 or 1.800.275.4242, ext. 4764. After much speculation regarding the next White House Chef, Michelle Obama announced Friday that Chef Cristeta Comerford will remain in her current position as White House Chef. Named to the position in 1995 by the Bushes, Comerford is the first female and the first minority to hold the position. Many people thought that a new White House Chef would be appointed because the Obamas have markedly different eating habits than the Bushes. According to the Huffington Post, "The President who notoriously wouldn't eat anything 'green' or 'wet' is being replaced by one who loves his meals straight from the garden. However, to reduce Comerford's abilities to BLTs and burgers seems a bit narrow. In addition to the dinners she has put on during her time as White House Chef, Comerford has also trained in hotels in the U.S. and has worked in Vienna, Austria. It seems that in addition to the many formal White House dinners she has organized (and BLTs), she will be quite able to handle vegetables and a low-carbohydrate diet. 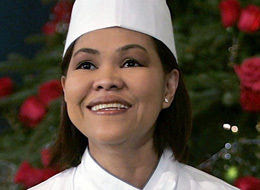 The Southern Food and Beverage Museum currently has Cristeta Comerford's chef whites on display in the White House Exhibit. Save loads of cash by dipping strawberries yourself. It's easy and elegant. Leave stems and green caps on berries. To ensure chocolate adheres to berries, make sure strawberries are free of outside moisture. Rinse, drain and carefully pat strawberries with a paper towel until dry. Be careful. Just one drop of moisture in melted chocolate will cause chocolate to seize (clump and harden). Chocolate-dipped strawberries are perfect for a romantic evening in, with candlelight and a bottle of wine. Add multi-colored sprinkles or roll in coconut or chopped nuts to make chocolate-dipped strawberries even more special and delicious. You won't find pepperoni anywhere near this specialty dessert! A cream cheese filling is spread over a sweet crust and topped with glazed strawberries. For crust, preheat oven to 400 degrees. Grease the bottom of a 12 or 14-inch pizza pan with a small amount of butter or cooking spray. In a large bowl, combine flour, margarine, pecans and brown sugar. Mix well with fork or pastry blender. Spread mixture in pizza pan by gently pressing and spreading dough evenly with palm of hand and fingertips to form a thin crust. Bake for 15 minutes or until golden brown. Cool. For filling, cream together cream cheese and powdered sugar in a large mixing bowl. Gently fold in whipped topping until thoroughly blended. Spread over cooled crust. For topping, combine gelatin, sugar, salt and ½ cup of the water in a medium saucepan. Dissolve cornstarch in remaining water. Stir into gelatin mixture. Cook over medium heat until thickened, stirring frequently. Allow topping to cool to room temperature. Remove caps from strawberries, wash, drain and slice in half lengthwise. Add strawberries to gelatin mixture and place in the refrigerator to chill for about 30 minutes. Spread topping on top of cream cheese layer and chill in a refrigerator for an hour before serving. Makes 10-12 servings. Short-Cut Method: Crust: Purchase one (18-ounce) tube refrigerated slice-and-bake sugar cookie dough. Bring to room temperature. Preheat oven to 350 degrees. Remove ends of package with a sharp knife and cut open along seam. Remove cookie dough from wrapper and place directly onto a 14 or 16-inch pizza pan. Form a crust directly in pizza pan by gently pressing and spreading dough evenly with palm of hand and fingertips. Bake at 350 degrees for about 8-10 minutes or until golden brown. Cool. When cookie dough crust is thoroughly cooled, top with cheesecake filling mixture as you would a pizza. Refrigerate for about 30 minutes or until chilled. Note: If a lighter texture is desired, place prepared cheesecake filling in a large mixing bowl and fold in 1 container (8-ounces) whipped topping (thawed). There may be some mixture remaining. Don’t worry. Any leftovers will be a welcomed surprise. Topping: Prepare topping as noted above. Return to refrigerator to chill an additional hour before serving. Makes 10-12 servings. The Manischewitz Company announces the six (6) finalists chosen to compete in the Third Annual Simply Manischewitz Cook-Off on February 13th at the New York Marriott Marquis. The six finalists were selected from among thousands of entries nationwide to compete LIVE for the chance to win the $25,000 grand prize package including GE Profile Kitchen appliances, cash and more. Mayor Bloomberg has proclaimed Feb. 13 as “Simply Manischewitz Cook-Off Day” in New York City. Out of the thousands of entries received, the top recipes were selected, tested and chosen by an expert panel of judges which included Sarah Lasry, cookbook author and restaurant owner. Ms. Lasry has written The Dairy Gourmet and owns and operates Tastebuds Café in Howell, NJ. The finalists’ recipes were judged on the following criteria: taste, 50%; ease of preparation, 25%; creativity and originality, 25%. The Grand Prize Winner will be selected on site by a panel of prestigious food experts including Todd Coleman, Food Editor, Saveur magazine; Emily Kaiser, Food Associate Editor, Food & Wine magazine; Michael Park, Epicurious.com; Armando Monterroso, Executive Chef, Marriott Marquis; and Joy Devor of Rockaway, NY the winner of the 2008 Simply Manischewitz Cook-off. Cooking with Kosher products and making ethnic creations based on Jewish Heritage is fast becoming one of today’s hottest food trends. According the foremost authority on Kosher Foods, Rabbi Yaakov Horowitz, “The Kosher consumer base is getting younger and stronger and now crosses all ethnic backgrounds.” Finalists selected for the Simply Manischewitz Cook-off include both Kosher and non-Kosher consumers. All ingredients in the competition must be certified kosher and the competition will be overseen by Rabbi Yaakov Horowitz. Rabbi Horowitz represents the OU as Rabbi in charge of Rabbinic supervision for all Manischewitz Company brands. So last night I was watching Alton Brown make gumbo on "Good Eats." He went through his way to make a roux. I've never had that much difficulty, but it brought to mind something I saw in Winn-Dixie the other day: roux in a jar. With Valentine’s Day just around the corner, our thoughts turn to bouquets of red roses, those rich, creamy chocolates in red heart-shaped boxes and romantic dinners. 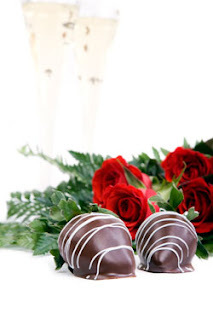 The flowers and candy are easy to decide on but what about that special Valentine’s Day dinner? This year why not plan a romantic dinner around delicious Florida seafood. Seafood is the perfect choice. It is quick and easy to prepare, flavorful and rich but light enough to allow for a late night of dancing. As an added benefit, seafood is a heart-healthy choice for you and your sweetheart with its high protein and low fat content and Omega-3 benefits. Omega-3 is the fatty-acid that has been linked to lowering the risk of heart attack, breast cancer, prostate cancer and stroke. So enjoy a “guilt free” evening knowing that you are doing something good for your special someone…except for those decadent, rich chocolates, that is. Keeping with the red color scheme of the day, you can choose a succulent Florida red snapper entree, lobster medallions in a creamy sauce or a wild pink shrimp pasta dish to make the evening memorable. Sprinkle fillets with seasonings then dredge in flour. Melt butter and oil in shallow skillet over medium-high heat; add fillets and cook 3-5 minutes per side until golden brown and cooked through. Remove fillets from skillet and serve with Roasted Red Pepper Chili. Cook all the ingredients in a large sauté pan for 20 minutes and puree in blender until smooth. Strain for a more refined sauce. Adjust the seasonings and serve hot. Combine Alfredo sauce, half & half, Parmesan cheese and pepper in large saucepan. Over low heat, bring to a simmer and cook for 5 minutes. Add cooked pasta and shrimp; gently stir to combine. To serve, twist fettuccine around fork to make a tight roll and center on plate; top with shrimp and sauce. Garnish with chopped parsley. Prepare wild rice per package instructions. While rice is cooking, melt butter in a large saucepan and sauté the carrots, celery and green onion for 3 or 4 minutes. Stir sautéed vegetables into cooked wild rice. Set aside. Combine soup, sherry, butter, and seasonings in a double boiler and heat thoroughly. If sauce gets too thick, add more sherry. Add lobster meat and stir until heated through. On individual plates, arrange lobster slices on wild rice and spoon sauce over. Serve remaining sauce separately. To find more Florida seafood recipes and information, visit www.FL-Seafood.com. Gray weather has me in a mellow kind of mood. That means soups, stews, chowders and roasted vegetables. Ergo, a slew of hearty recipes comes your way in Your Table for Wednesday's Anniston Star. 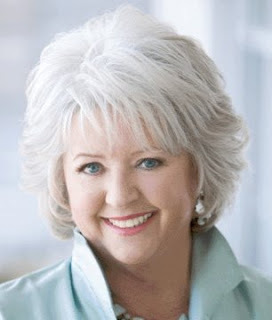 If you need something sweet, then Prudence Hilburn is cooking up some lovely praline-inspired desserts. We've also got some perky salads and fine recipes for pork chops. The Alabama Senior/Junior High State Beef Cook-Off will be this Saturday at the Alabama Cattlemen’s Association building in downtown Montgomery with the judging process starting at 10 a.m. and winners to be announced just after noon. “I am excited about the overwhelming entries in the junior division and I am looking forward to seeing what this age-group brings to the table,” says Alabama Cattlewomen’s Association President Nancy Dickerson. Forty-one students from 26 counties across the state will compete for cash prizes. A large capacity microwave oven and $100 will be awarded to the “Best in Beef” winner’s Family & Consumer Sciences classroom for instructional purposes. The State Beef Cook-Off not only educates students about the nutritional value of beef, but also familiarizes them with various cooking methods and emphasizes safe food handling. 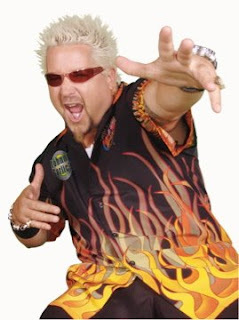 An earlier post alluded to some of the hot flavor trends expected for 2009. The year, according to spice purveyor McCormick, is going to continue getting more exotic. Whether this is an attempt to lure weak-willed spice junkies like me -- or whether they think Agave nectar will truly go mainstream -- remains to be seen. But their recipe suggestions this year continue to call for more ethnic ingredients. I don't know that polenta's gone mainstream in the South yet (although my grandma used to fix cornmeal mush), but they're trying to nudge us toward bold flavors. I've used toasted sesame seeds several times in the past few weeks. This recipe was super easy and oh, so hearty. Highly recommended. Preheat oven to 300°F. Coat short ribs with flour. Heat 1 tablespoon of the oil in 5-quart Dutch oven or ovenproof saucepot on medium-high heat. Add 1/2 of the short ribs; cook 5 to 10 minutes or until browned on all sides. Remove from Dutch oven. Repeat with remaining short ribs. Heat remaining 1 tablespoon oil in Dutch oven on medium heat. Add garlic, celery, onions and parsnips; cook and stir 3 minutes or until lightly browned. Add root beer, water, bouillon cubes, tomato paste, vinegar, bay leaves, 2 teaspoons of the sesame seed, sea salt and pepper. Bring to boil, stirring to loosen browned bits in bottom of Dutch oven. Return short ribs to Dutch oven, stirring to partially cover short ribs in liquid. Cover. Braise in oven 2 hours. Add sweet potatoes; cover and braise 1 hour longer or until short ribs and sweet potatoes are tender. Skim fat from liquid. Divide short ribs and vegetables among serving bowls. Top each with sauce. 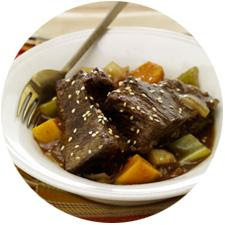 Sprinkle short ribs evenly with remaining 1 teaspoon sesame seed. Preheat oven to 325°F. Mix flour, baking powder, rosemary and salt in small bowl. Butter and flour 9-inch springform pan. Slice brie evenly into 3 horizontal layers. Place 1 layer, skin-side down, in center of bottom of prepared pan. Cut remaining 2 layers in half. Place, skin-side down, around brie in pan so that most of the bottom of the pan is covered with brie, leaving about 1/2-inch uncovered around edge of inside of pan. Set aside. 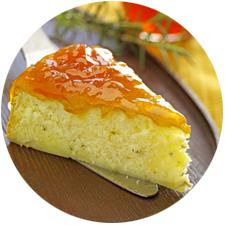 Beat butter and 1/4 cup of the sugar in large bowl with electric mixer on medium-high speed 3 to 4 minutes or until light and fluffy, scraping sides of bowl occasionally. Add egg yolks, beat on high speed until well blended, scraping sides of bowl occasionally. Beat in 1/2 of the flour mixture, milk then remaining flour mixture on low speed until well blended, scraping sides of bowl occasionally. Beat egg whites in clean large bowl with electric mixer on high speed 2 minutes or until soft peaks form. Mix remaining 1/2 cup sugar and cream of tartar in small bowl. Gradually beat into egg whites until stiff peaks form. Stir 1/3 of the egg white mixture into egg yolk mixture until well blended. Gently stir or fold in remaining egg white mixture. Pour and spread batter over brie to create an even cake layer. Bake 30 to 35 minutes or until toothpick inserted in center comes out clean. Run small knife or metal spatula around rim of pan to loosen cake. Cool about 30 minutes in pan on wire rack. Remove rim of pan. Spread top of cake evenly with preserves. Serve warm. Refrigerate any leftover cake. To Make Ahead: Prepare and bake cake as directed above. Cool completely. Cover tightly. Refrigerate. Several hours before serving, remove cake from refrigerator and bring to room temperature. Remove rim of pan. Place cake on baking sheet. Spread top of cake evenly with preserves. Heat in preheated 350°F oven 15 to 20 minutes or until warmed through. Experts extol the virtues of the colorful fruits and vegetables. The folks at Royal Rose Radicchio have a snappy salad idea. Combine chopped radicchio, spinach leaves, sliced Bartlett pear and red onion in a bowl. In small saucepan, heat vinegar and oil gently over medium heat until hot; immediately pour dressing over salad and toss until evenly dressed. Season with salt and pepper, top with crumbled Gorgonzola and caramelized pecans and serve at once. Lightly grease a rimmed cookie sheet. Set aside. In a small saucepan bring sugar and water to a boil. Increase heat to medium-high and cook syrup without stirring until mixture turns golden, about 10 minutes. Remove from heat. Stir in pecans, and then spread pecans in a single layer on prepared sheet. Let stand until cool, then break into small pieces. Makes 1 cup. Store covered at room temperature. *To toast nuts, place on a shallow baking sheet and bake at 350 degrees F. for 10 minutes, until fragrant. A cast iron skillet, your favorite Martha White Cornbread Mix, and a dash of creativity could bring you the $5,000 First Prize in the 2009 National Cornbread Cook-Off. Entries for original main dish cornbread recipes are now being accepted until Feb. 28, 2009, by The National Cornbread Festival for its 13th Annual Cook-Off, sponsored by Martha White and Lodge Cast Iron. Ten finalists will compete during the National Cornbread Festival and create their original cornbread specialties under the Big Cook-Off Tent on April 25 in South Pittsburg, Tenn. One lucky winner will be chosen as the reigning cornbread champion and receive $5,000 and a 30-inch stainless steel gas range (a $2,500 value) from Five Star Professional Cooking Equipment, a division of Brown Stove Works, Inc. In 2003, the trend began to heat up with the winning White Chicken Chili with Cheddar Hush Puppy Crust recipe. In 2005, South-of-the Border Chicken Fiesta took second place. And, in 2007, it was Southwest-inspired Chicken Taco Cornbread Wedges with Ranchero Cilantro Drizzle (find recipe at www.marthawhite.com) that came out on top. To qualify for the National Cornbread Cook-Off this year, an entry must be an original main dish recipe and prepared with at least one package of Martha White® Cornbread Mix using Lodge® Cast Iron cookware. Entries must also include contestant’s name, address, daytime phone number, date of birth, and name of grocery retailer. To enter online, go to the “Promotion and News” section at www.marthawhite.com, and submit your original recipe along with complete contact information. 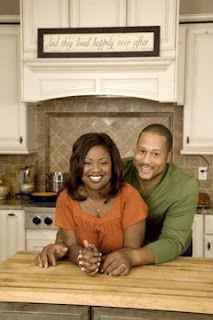 To enter by e-mail, send your original recipe along with your complete contact information to cornbread@dvl.com. Online and e-mail entries must be received by 11:59 p.m. CST on Feb. 28, 2009. To enter by mail, send your original recipe and complete contact information on an 8 1/2 x 11-inch paper to: National Cornbread Cook-Off 2009, 209 Seventh Avenue North, Nashville, TN 37219. Mail-in entries must be postmarked by Feb. 28 and received by March 6. Ten finalists will be chosen from all entries. For past winning recipes and complete contest rules, visit www.marthawhite.com or www.lodgemfg.com. The Cook-Off grand champion will win a $5,000 cash prize and a 30-inch stainless steel gas range (a $2,500 value) from Five Star® Professional Cooking Equipment, a division of Brown Stove Works, Inc., and special gifts from Martha White and Lodge® Cast Iron. The second prize winner will walk away with $1,000, the third prize winner with $600. The remaining seven finalists will each be awarded $100. All finalists will receive $500 travel reimbursement and gifts courtesy of Martha White and Lodge® Cast Iron. Sponsored by Martha White Foods, Inc., Lodge Manufacturing Company, and Brown Stove Works, Inc. Open to legal residents of the United States and D.C., 18 years or older, except food professionals, such as chefs, food writers, or food home economists who create recipes for pay. Void outside the 50 United States and D.C. and where prohibited. Heat oven to 400 degrees. Heat oil over medium heat in a 10 1/2 - inch Lodge cast iron skillet. Add 1 cup onion, garlic, green pepper, cumin and chili powder; sauté about 3 to 5 minutes or until vegetables are tender. Add remaining filling ingredients; simmer about 10 minutes. Shredded lettuce, sour cream, salsa, Mexican style shredded cheese to garnish. Heat oven to 375 degrees. Melt butter in a 10 1/2 - inch Lodge® cast iron skillet. Add onion and garlic; cook until tender. Transfer to medium bowl; set aside. Wipe skillet with paper towel. Combine chicken, soup, sour cream, beans and 4 tablespoons of the chilies in skillet; stir until blended. Add cornbread mix, cheese, milk, corn, egg and remaining chilies to bowl with cooked onions and garlic; stir until blended. Spread cornbread mixture over chicken filling. Bake 30 to 35 minutes or until cornbread topping is golden brown. (Place foil or pan on lower rack, in case filling bubbles over.) Cut into wedges; garnish each slice with shredded lettuce, sour cream salsa and cheese. My 6-year-old doesn't usually eat much. She'll eat anything, mind you, but she's a bit on the wee side and therefore doesn't require a whole lot to fill her up. The exception: popcorn. The child will eat popcorn until it comes out her ears and her midsection resembles a thermometer that has been stuffed with a beach ball. I'm always on the lookout for things to enliven popcorn. It's never been my favorite, but the little ones devour it. Put popcorn in a large bowl and lightly spray with cooking spray. Sprinkle cocoa mix and cinnamon on popcorn. Toss to coat evenly. Spray and toss again until mixture is well coated. Serve immediately. Maybe it's the gray day, but something roasted sounds fabulous for dinner tonight. Roasting is simply the act of cooking something by surrounding it with dry heat (oven, in this case), uncovered. The heat penetrates, slow and steady, the surface of the meat and then finishes off the cooking process by browning or caramelizing the surface. You can bake something in the oven, covered, but the trapped moisture will steam-bake your food -- not give it a good roast, which needs that dry air swirling about. 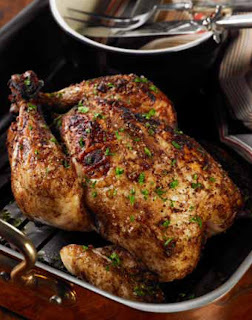 From the National Chicken Council and U.S. Poultry & Egg Association, here are two new recipes that feature roast chicken. One uses a pre-cooked, rotisserie chicken to make a delicious salad; the other is a new way to roast at home. Cuban-style Gingered Chicken is made with the easiest-to-cook, and perhaps most impressive-looking, piece of chicken available: the whole bird. Marinate a four to six pound chicken in a Cuban-influenced blend of ginger, garlic, allspice, cinnamon, cumin, brown sugar, chicken broth, lime juice, orange juice, Worcestershire sauce and hot sauce. Place in hot oven and roast, cooking to the 180 degree temperature in the deepest part of the thigh. Sprinkle with chopped cilantro before serving. This chicken dish works well with a side serving of rice and a green vegetable. In small bowl, combine all marinade ingredients. Place chicken in large plastic bag, such as an oven roasting bag. Pour marinade over chicken. Seal bag and place in refrigerator 8 hours to overnight, turning occasionally to ensure even distribution of marinade. Remove chicken from refrigerator 30 minutes prior to cooking to bring to room temperature. Preheat oven to 350 F.
Remove chicken from marinade and place, breast side up, in a roasting pan. Dispose of leftover marinade. Sprinkle chicken with salt and pepper. Place chicken in hot oven and roast 20 minutes per pound, or approximately 1 hour and 20 minutes for a four pound chicken. When done, internal temperature of the chicken at the thickest part of the thigh will read 180 F. Remove chicken from oven and rest for 10 minutes before carving. Serve sprinkled with minced cilantro. 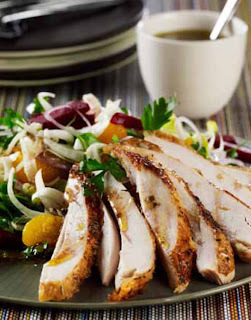 A tasty entrée salad, Roast Chicken and Beet Salad is light in flavor and beautiful in color. Start by roasting beets in a hot oven; when cooled, slice to a half-inch thickness. While the beets are cooking, assemble the rest of the salad by slicing pieces of white and dark meat from a pre-cooked, rotisserie chicken, and tossing together slices of fennel, Belgian endive, shallot, parsley and segments of canned mandarin oranges. Make a vinaigrette dressing by combining lemon juice, red wine vinegar, sugar, anchovy paste, capers, salt, pepper and olive oil. For presentation, layer the salad by placing the beets on a plate or serving platter, top with the greens tossed with vinaigrette, and placing chicken slices on over all. Preheat oven to 350. Place beets on piece of foil, drizzle with olive oil and wrap up in the foil. Place on baking sheet and roast in hot oven for 1 hour, or until tender. Remove from oven and cool. Slice beets thinly. While beets are roasting, combine all ingredients for dressing, except olive oil, in small bowl and set aside. In large serving bowl, combine all ingredients for salad. When ready to serve, whisk olive oil into dressing and combine well. Toss two-thirds of vinaigrette with salad ingredients. Place beets on top of salad. Top with slices of chicken. Drizzle remaining salad dressing over chicken slices. By now it might be clear to some Star Bite readers that I'm a spice junky. Well, the spice fairy came from McCormick last week and had some cool stuff in it: garam masala, which was rubbed into some pork chops, and a three-peppercorn medley that was beautiful to look at and sniff. One thing I've discovered as I've become more adventurous (and I realize my 'adventurous' would probably kill some people of the "chicken fingers only" mentality) is that I've sharply reduced the amount of salt I put in food. You know how the nutrition/health gurus say that using herbs and spices can eliminate some of the need for salt infusion? Turns out, they were right. I like to think that by playing with other spices, I've taken salt use back to its intent: a seasoning that enhances the flavors of foods but one that does not provide a prominent note in a dish. Herb treasures found in the garden this past week included some flat-leaf parsley that's still chugging along and sorrel that's going into soup this weekend.